My somewhat senescent MacBook Pro 17” has been doing the ‘fainting goat’ thing recently. We’d be happily chugging away, then suddenly – freeze, black screen (or grey screen) of death – complete lock up. The screen’s backlight was still on (as shown by the glowing white Apple logo on the other side). Cycle the power, it would freeze on the grey screen after the Apple logo appears. But the grey screen was odd (not the moire from a bad iPhone snap – note the stripes! ): If left for a few minutes (or longer), it would shut down. Powering up again brought everything back. If you held the power button down for >5 secs, it would power down but do the same thing. Hmmm. Clue. Talks to some Apple dealer and repair folks sounded bad – ‘Graphics chip has gone’, ‘New motherboard’, and ‘bring it in and we’ll soak test it for a week.’ Well, it was happening two to five times a week. Not awful. Worth limping along whilst I decided what new MacBook Pro to buy. The weather has been hot recently, so I wondered if that was at fault. I installed Temperature Gauge from Tunabelly Software, and this told me an interesting story. During background render tasks, things were getting very hot indeed. 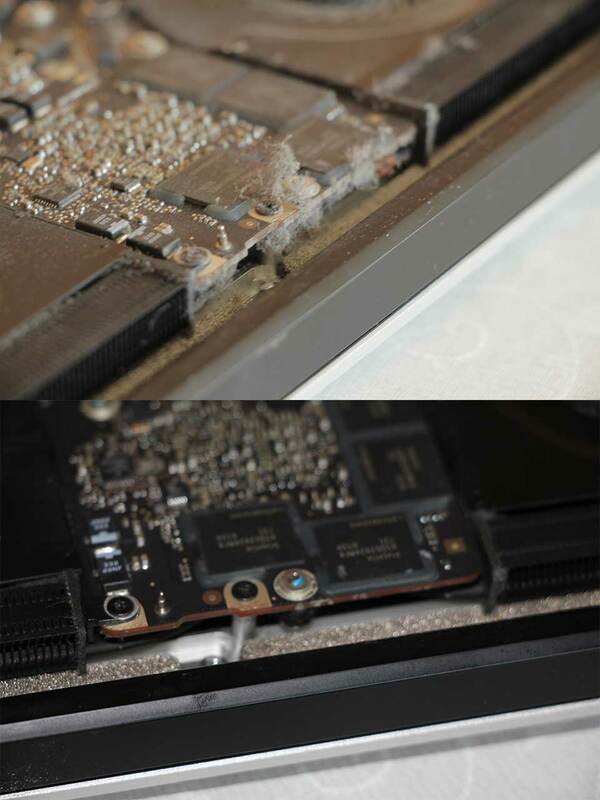 CPUs and GPUs would reach 100 degrees Celsius, but more to the point, the fans were pretty much running full pelt as soon as the Mac had something (anything) to chew on. Sadly, when the Mac did its fainting goat, it wiped the log file for Temperature Gauge (this issue now fixed in v4.4.2), but it was pretty obvious what was going on. The Mac was getting super hot, and was cutting out. It wouldn’t reboot properly until it had cooled down. It dawned on me that this machine is over three years old, and it’s never had the air filters cleaned. I put a date in the diary to take it to MacDaddy to have it sorted (and some extra RAM whilst we were at it). Then the British weather intervened – the office was getting very warm. The Mac started fainting several times a day even with a desk fan blowing on it, and something really had to be done. So armed with my smallest Phillips screwdriver, a little paintbrush and a vacuum cleaner, I decided to DIY. 10 screws later, and we were in. Pretty obvious once the back was off. 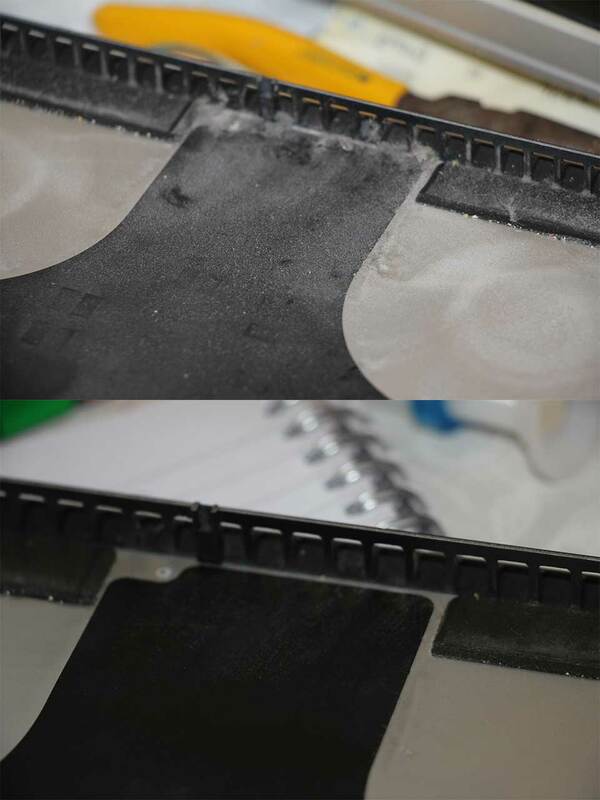 Before and after: So, very easy process – should have done it sooner, wasn’t as bad as suspected. UPDATE: I’ve been advised by dear friend Marcus Durham that using a vacuum cleaner nozzle close to electronics is not such a wise thing – apparently the air flow can cause static electricity build-up which can fry delicate electronics. Hence the standard recommendation of using clean compressed air (he advises doing this outside). I stand corrected. 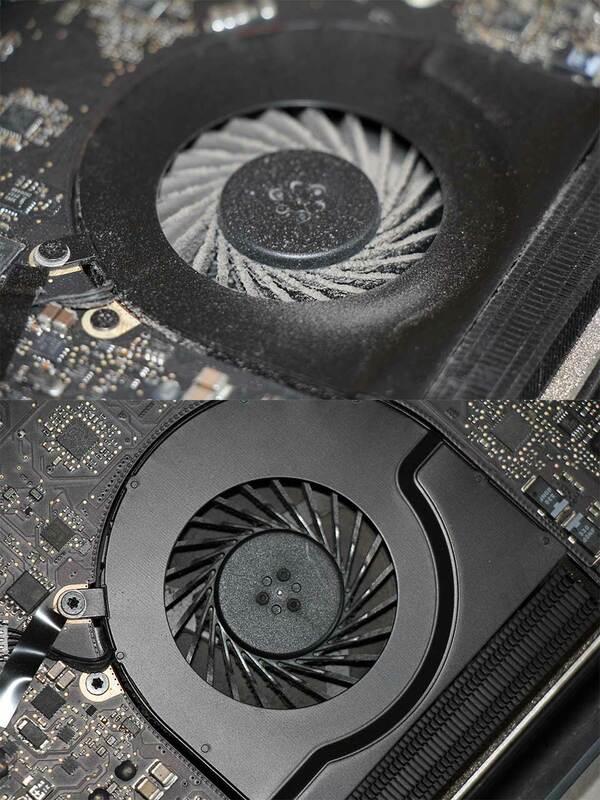 Since the cleaning, the fans are running at much more sedate speeds and less often. Of course, when a really big render or encode chugs through, it does warm up quite a bit – but no 100 Degree alarms, no 6000 RPM fans. And no crashes. No faints. No ‘grey screen of death’ with Paul Smith stripes on it. The MacBook Pro rides again! * And only today have I noticed Apple have refreshed their MacBook Pro line with double the RAM and a few more cycles per second for a little less money all round. Joy! I’ve had some bad luck with MXF ingest to FCP, the Canon C300 variety needed a bit of voodoo. This weekend, I’m playing with images of Panasonic’s P2 media, copied onto an NTFS formatted USB3 drive. FCPX couldn’t see anything. It knew there was a P2 card there, just didn’t see anything. Okay, moving on. I’ve recently ditched Adobe Creative Cloud for being too expensive to maintain for an FCPX editor, but I still kept Adobe CS6 as there are some things (Audition, Encore, Photoshop and Illustrator) that I need – if not the latest versions thereof. So, surprise, surprise, Adobe Premiere Pro and Adobe Prelude could both see the P2 card. I started a Transcode from the MXF files to ProRes 422. If we skip the issues that cropped up trying to make that happen reliably, I also fired up Final Cut Pro 7 – which has a ‘Log and Transfer’ mode that also saw the P2 card images and willingly imported them whilst transcoding to ProRes. And here’s the catch: FCP7 did 90 mins of P2 rushes in about 45 minutes. Adobe Prelude did the same in about 90 minutes. So, we’d expect the Prelude transcodes to be better than the FCP7 transcodes – it took longer, the software is newer. Stands to reason, right? The two versions look visually identical. Flipping between them, there’s no visible difference. You may have to do this side by side. It’s actually a big difference. Check out her hair. The Adobe Media Encoder version has barely visible jumps in luminance. Barely visible on a monitor. but it’s about 1-2 IRE. The FCP7 Transcode versions do not. They are ‘cleaner’. Yes, I obsess (!) about this – because I’m chromakeying the results, and ‘bumps’ in luminance can upset the keying settings. So, I’d recommend FCP7 over Adobe for ingesting P2 cards for measurable speed and quality reasons. I wish FCPX would ingest P2 direct from disk, but my installation doesn’t work (it didn’t work with C300 for a while, until I found the fix). So there you go. I know Adobe Media Encoder gets a good write-up, but in this case I have to hand it to FCP7. I wonder if I’m missing a secret folder for P2 ingest in FCPX? I’m just back from a shoot in the Middle East where I filmed four countries in four days; Dubai, Abu Dhabi, Qatar and Bahrain. Not a lot of information was available with regards filming in these countries, what was available I must admit was fairly vague. So I’ve put together my experiences, which will give you an insight into filming in the Middle East. You’ll need ‘Pro-forma Equipment List’ also known as a Duplicate List. It’s a list of the equipment you are traveling with and should include the manufacturer, model number, serial number, the country of manufacture and the value of all of the kit. The list should be printed on a letterhead.